How to watch Dominion Creek: Dominion Creek: Season 2 (2016) on Netflix South Africa! Sorry, Dominion Creek: Dominion Creek: Season 2 is not available on South African Netflix, but you can unlock it right now in South Africa and start watching! With a few simple steps you can change your Netflix region to a country like New Zealand and start watching New Zealand Netflix, which includes Dominion Creek: Dominion Creek: Season 2. We'll keep checking Netflix South Africa for Dominion Creek: Dominion Creek: Season 2, and this page will be updated with any changes. Dominion Creek: Dominion Creek: Season 2 is not available in South Africa BUT it can be unlocked and viewed! Three Irish brothers arrive in the Yukon during the Gold Rush hoping to strike it rich, but a powerful man and greed soon divide them. Three immigrant siblings dig for wealth during the Gold Rush. But in this town, greed runs deeper than brotherly love. Season 1 of Dominion Creek has 4 episodes. Because different Netflix countries have different availability for episodes, you'll need to check the episode listing below to see which are available in South Africa. After their brother Séamus absconds with a map and deed to a Klondike gold strike, Tom and Pádraig follow him to Dominion Creek to salvage the claim. Séamus plunges the Connolly brothers into more trouble when a confrontation with saloon owner JJ Hopkins leads to a vow of revenge from JJ's father. Séamus steals some of the Connolly gold to go into business with a questionable partner, while Tom and Skookum Jim's sister pursue a romance. Revenge-hungry Jacob Hopkins persuades a down-and-out Petey to burn down Séamus's new tavern and then convinces Séamus that he must kill Tom. Dominion Creek: Season 2 of Dominion Creek has 4 episodes. Because different Netflix countries have different availability for episodes, you'll need to check the episode listing below to see which are available in South Africa. Tom Connolly's bathhouse opens for business. A judge is compromised. A long-lost cousin arrives from Ireland. Typhoid spreads. Cousin Mici isn't being honest. Kate sinks into depression over her missing baby. Sam Steele leaves a murderer in charge of the town. Séamus demands to see his son. Jacob is hospitalized with typhoid fever. 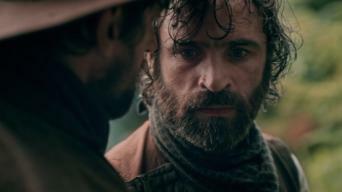 Captain Pat gets out of jail and confronts Pádraig. Love is in the air and revenge is the order of the day for the Connolly brothers. Tom makes Jacob an offer he can't refuse.